"We are excited to launch this line of WEDA pumps into the market and believe these will be crucial on job sites spanning several different markets," said Joe Moser, product manager – pumps at CP. "These pumps were designed with the customer in mind. For as lightweight and small as they are, it is an incredibly durable and wear resistant line that customers will have tremendous success with." The WEDA 10 comes in a single-phase or three-phase pump type. The single-phase features 1.5 hp, while the three-phase is 1.2 hp. Weighing 27.5 pounds, the pump's dimensions include a circumference of 7.2 inches, width of 8.7 inches and length of 17.4 inches. Designed for heavy-duty pumping of abrasive liquids, the WEDA 10 has a maximum submersible depth of 66 feet. It also allows a maximum flow of 117 U.S. gpm and a maximum solid handling size of .16 inches. The WEDA 30 comes in a single-phase (2.7 hp) or three-phase (2.5 hp) pump type. Weighing 44 pounds, the pump's dimensions include a circumference of 8.7 inches, width of 11.2 inches and length of 19.8 inches. 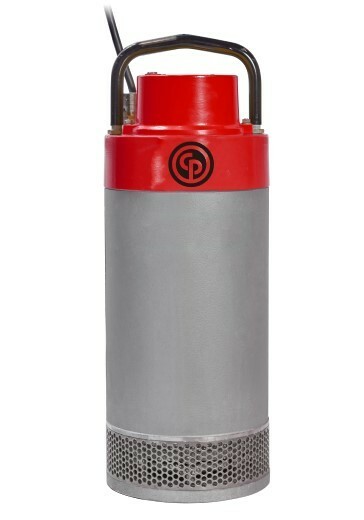 This pump has a maximum submersible depth of 66 feet, allowing a maximum flow of 370 U.S. gpm and a maximum solid handling size of .27 inches. The WEDA 40 is a three-phase, 4-hp pump. Weighing 55 pounds, it has a circumference of 8.7 inches, width of 11.3 inches and height of 19.8 inches. The submersible depth of the WEDA 40 is 66 feet, allowing a maximum flow of 420 U.S. gpm and maximum solid handling size of .27 inches. This pump comes in a normal head (NH) or high head (HH) configuration, offering 8.5 hp. Weighing 122 pounds, the pump has a circumference of 10.9 inches, width of 13 inches (NH) or 11.9 inches (HH) and height of 28.3 inches. At 66 feet of submersible depth, the WEDA 50+ allows a maximum flow of 620 U.S. gpm (NH) or 310 U.S. gpm (HH) and maximum solid handling size of .32 inches. The pump comes in a normal head, high head or super high head configuration, offering 11.5 hp. Weighing 134 pounds, the pump has a circumference of 10.9 inches, width of 13 inches (NH) or 11.9 inches (HH, SH) and length of 29.9 inches. At 66 feet of submersible depth, the WEDA 60+ allows a maximum flow of 700 U.S. gpm (NH) or 340 U.S. gpm (HH) and 260 U.S. gpm (SH). The maximum solid handling size is .32 inches. The super high head model is the smallest and lightest in its class.